GitHub - dzeedzed/dzeedzed.github.io: My personal blogging website built with Jekyll. Updated daily. Want to be notified of new releases in dzeedzed/dzeedzed.github.io? 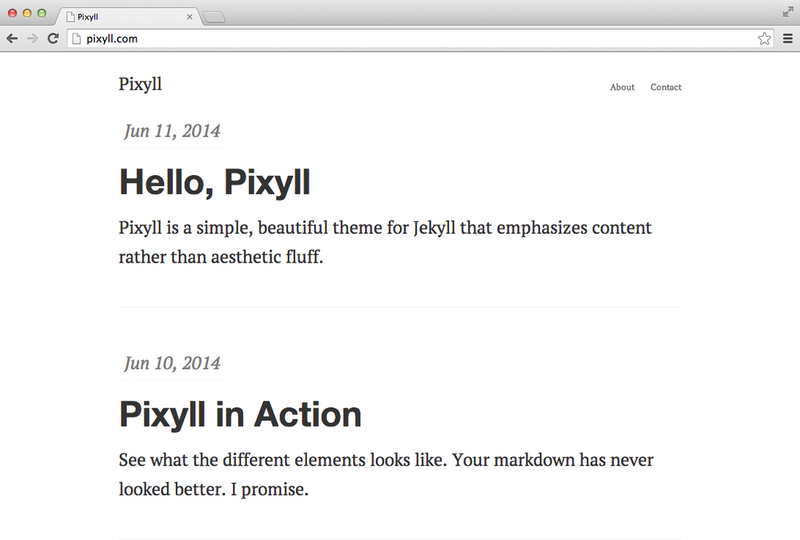 Pixyll is a simple, beautiful theme for Jekyll that emphasizes content rather than aesthetic fluff. It's mobile first, fluidly responsive, and delightfully lightweight. It's pretty minimal, but leverages large type and drastic contrast to make a statement, on all devices. If you're completely new to Jekyll, I recommend checking out the documentation at http://jekyllrb.com or there's a tutorial by Smashing Magazine. It's important to also check your version of Jekyll since this project uses new baseurl features that are only supported in 3.3+. Fork the repo, and then clone it so you've got the code locally. description: "A simple, beautiful theme for Jekyll that emphasizes content rather than aesthetic fluff." Then, start the Jekyll Server. I always like to give the --watch option so it updates the generated HTML when I make changes. Now you can navigate to localhost:4000 in your browser to see the site. You can host your Jekyll site for free with Github Pages. Click here for more information. In addition to your github-username.github.io repo that maps to the root url, you can serve up sites by using a gh-pages branch for other repos so they're available at github-username.github.io/repo-name. This will ensure that the the correct relative path is constructed for your assets and posts. Also, in order to run the project locally, you will need to specify the blank string for the baseurl: $ jekyll serve --baseurl ''. The contact form uses http://formspree.io. It will require you to fill the form out and submit it once, before going live, to confirm your email. To configure Disqus, set up a Disqus site with the same name as your site. Then, in _config.yml, edit the disqus_shortname value to enable Disqus. All variables can be found in the _sass/_variables.scss file, toggle these as you'd like to change the look and feel of Pixyll. If you would like to add a fade-in-down effect, you can add animated: true to your _config.yml. See documentation for more options. If you want to give credit to the Pixyll theme with a link to http://pixyll.com or my personal website http://johnotander.com somewhere, that'd be awesome. No worries if you don't. You can measure visits to your website either by using Google Analytics tracking embed or the more advanced Google Tag Manager container. For Google Analytics set up the value for google_analytics, it should be something like google_analytics: UA-XXXXXXXX-X. For Google Tag Manager set up the value for google_tag_manager, it should be something like: google_tag_manager: GTM-XXXXX. Do not set both of above methods because this will cause conflicts and skew your reporting data. Remember that you need to properly configure the GTM container in its admin panel if you want it to work. More info is available in GTM's docs. In order to get more information about your website's status in search engines, you can register it in Google Search Console and/or Bing Webmaster Tools. Both these tools will ask you to authorize your website with them and there are couple of ways to do that. Pixyll supports verification via meta tags - just fill in values for google_verification and/or bing_verification in _config.yml, the verification strings and meta tags will then be added automatically. If search engine optimization is your thing, you can also set up meta_description values for each page/post. By default Pixyll uses summary to populate the <meta name="description" content="..."> tag and falls back to description from _config.yml if summary is not present in page/post's front matter. The summary is also used for generating Open Graph tags. Why would you want to use a dedicated variable for meta description? Because character limit to properly display this description in search results (as a snippet) is way smaller than in Open Graph. It is recommended to keep it at 155-160 characters, for more in-depth info read this article. And lastly - if you happen to write in language other than English be sure to change og_locale in _config.yml to reflect it. I hope you enjoy using Pixyll. If you encounter any issues, please feel free to let me know by creating an issue. I'd love to help. Pixyll is always being improved by its users, so sometimes one may need to upgrade. There may be merge conflicts, so be sure to fix the files that git lists if they occur. That's it!